Color is what makes your college decor stand out, and you'll find no shortage of color on these Mini Dorm Lights - Multi-Color - Green Wire. These lights for college are cheap dorm supplies, so you can buy a few sets and take those dorm decorating ideas to the sky... or maybe just the ceiling. College decorations like mini lights also bring a boost of cheer and festivity to your college dorm room, which never hurts, no matter the time of year! And since these incandescent lights light up bright, they'll be college wall decor items that will be hard to miss. 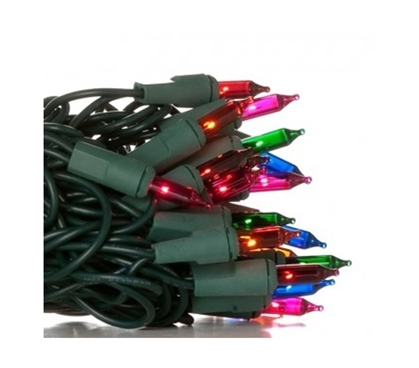 You can string mini lights along the edge of your ceiling, or you can wrap them around your dorm desk. Half the fun of these cheap lights for college is thinking of ways to use them. Dorm decorations are essentials for college after all, and mini lights, being cheap dorm stuff, are an ideal way to decorate your dorm. They're also useful dorm room items since you can use them at night to provide light for studying if your roommate is asleep. Or, if you're just looking for some more relaxed, lower lighting, flip on these college lights and you'll have a fun lighting display for any season.